Only a crazy avocado fan like me can dream up this edible creation to eat. 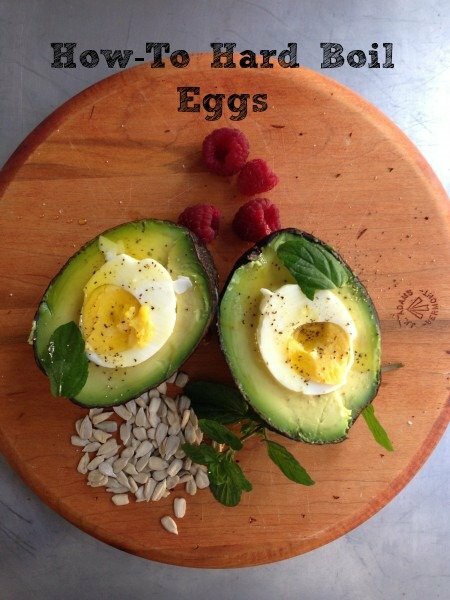 But, I craved eggs, and I had an avocado on hand too to eat – so I married the two and they fit together perfectly! Use them in a brunch line-up for a surprise entree. Want to get rid of the ugly green line around the yolks! Pairing these two simple ingredients together, brings a beautiful healthful meal to the table. With added arugula or greens it makes a beautiful presentation for any party. Place eggs in a saucepan in a single row. Do not overcrowd. Fill saucepan with water 1-2 inches of water above eggs. Bring the pan to boil and immediately reduce to simmering. Simmer for exactly 6 minutes. Remove from heat, cover, and allow to sit for 10 minutes. Eggs can also be placed in cold water to cool, before peeling. Tap the shells with the back of a spoon to crack them. Start at the rounded end of the egg where the air sack is, and peel off the shells under a trickle of cold running water. The water will run between the solid egg white and the shell making it easier to peel. Hard-boil the eggs, peel, and slowly cut eggs in half with a sharp knife. Sprinkle the avocados lightly with lemon to keep them from turning brown. Add the egg to the center of each avocado. Gently press into hole. Sprinkle with fresh lemon or olive oil. Serve as is, or place salad greens on the plate and place on top. Peeling under water creates a non-blemished peeled egg. The secret to getting a beautiful egg without the green around the yolk is to not overcook the egg. Happy to vote for you, Mary…The “love” button hadn’t shown up when I tried earlier. Gremlins in my computer, I guess. Looking forward to your upcoming cooking class.